Forget timecodes and confusing descriptions – with Wipster you just point and click to say what’s on your mind – it’s fast and intuitive, and leaves no room for misunderstanding. And because everyone can see and reply to each other’s comments, there’s no more contradictory feedback. When the next version is ready, it gets dragged into Wipster, right on top of the old one. 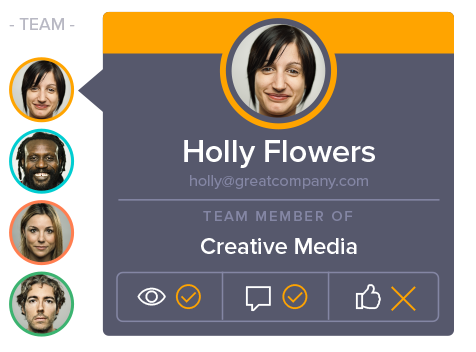 With a single click the team can refer to earlier versions and track rounds of changes for complete transparency. All the comments are turned into a to-do list for creators to work from – no more copying and pasting from emails. This shows the progress of the latest edit, and ensures nothing is missed. Wipster couldn’t be simpler to use, with drag-and-drop uploading and pro-level video encoding and playback. It’s a cinch to send videos, images, and PDFs to reviewers, and they don’t need an account to make comments. Wipster works alongside all your favorite production, collaboration and publishing apps – including Adobe Creative Cloud, Slack, Brightcove, Wistia, Vimeo, Facebook, Twitter and YouTube. It’s super-simple for key stakeholders to approve media, and to refer back to those approvals at a later date. Once your media asset is approved, one-click publishing to your favourite platforms makes it easy to take your content to the world. Should the need arise, you can always refer back to earlier versions and past projects with just a few clicks. Give separate teams (including internal staff and external contractors) access to different streams of work, ensuring everyone has access to the files they need – and none they don’t. Unlimited users per account means your entire company is covered.